Dying to Live... as a child of God by the Spirit of adoption: What do you let your children read? watch? listen to? What do you let your children read? watch? listen to? This is a question that has come up a number of times in my life in the last few years. And just about every discussion has had valid things to consider. We know that what they read, what they see, and what they listen to will influence them, and because we love them we want the influence to be favorable. We also know that there are many worldviews competing for their attention and loyalty...there is One True God and many false ones that do not announce themselves as deceitful, though they are. When our children are little, unable to read to themselves, this arena is not so hard...we simply choose what we read to them. We pick the movies they watch. We select the music being played in the house. But as our children grow older, we cannot preview everything they read, see and listen to...we are finite and time does not allow for it. 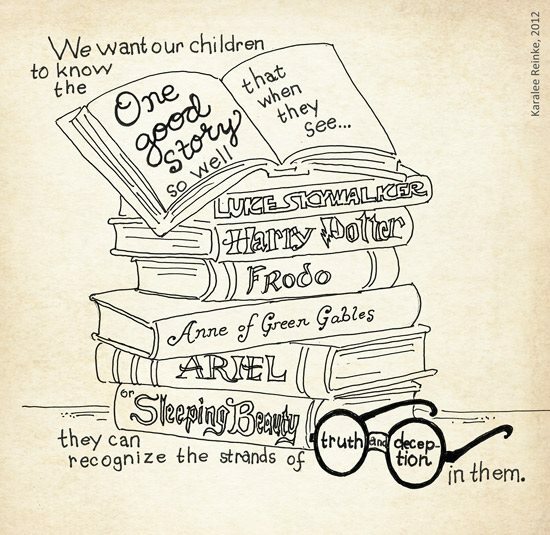 What do you do to monitor what your children read? Or watch? Or listen to? What limits do you set, if any? What kind of discussions do you have with your children about what they are interacting with, be it via movies, books, or music? How do you help them know God and His story so well that they can discern truth from lie in our society? I would love to hear from you in the comment area below.